British bass baritone Mark Glanville and pianist Alexander Knapp perform the US premiere of the extraordinary song cycle, “A Yiddish Winterreise.” The songs celebrate the richness of Jewish life and culture with love and humor, while exploring the depths of Jewish tragedy and the loss of a monumental European Jewish civilization. The performance has been been met with great acclaim in Britain as a brilliantly creative act of musical memory for our own age. Mark Glanville read Classics and Philosophy at Oxford University before winning a scholarship to study singing at the RNCM and the National Opera Studio, going on to make his debut with Opera North. Roles for that company include The King of Clubs (Love for Three Oranges), the King (Aida), Nourabad (Pearl Fishers) and Father (The Jewel Box). For Scottish Opera he has sung Commendatore (Don Giovanni), for Lisbon Opera, New Israeli Opera and Opera Zuid The King of Clubs, and for Opera Omaha Ferrando (Il Trovatore.) On the concert platform he has performed as bass soloist with Lord Menuhin, Daniele Gatti, Pascal Tortelier, Sir David Willcocks and Stanislaw Skrowaczewski. Recordings include A Yiddish Winterreise, Donizetti’s L’Assedio di Calais and Anna Bolena and Schubert Mass in G. His memoir The Goldberg Variations was shortlisted for the Wingate Prize for Jewish Literature and the National Sporting Club Award. Alexander Knapp graduated from Selwyn College, Cambridge, with MA, MusB, and PhD degrees in music, and he has also been awarded ARCM, LRAM and HonARAM diplomas. Over a period of more than 35 years, he has published and lectured on the subject of Jewish music in the UK, Ireland, Holland, Sweden, Germany, Switzerland, Hungary, Romania, Greece, Israel, USA, Russia, and China. As well as composing, arranging, conducting, broadcasting, and performing as pianist in the UK, Germany, Hungary, Lithuania, Russia and USA, Alexander Knapp has been involved as consultant and accompanist to cantors and choirs on several commercial recordings of Jewish music. His set of Four Sephardi Songs (arranged for voice and piano) was published in New York in 1992, and his Elegy for String Orchestra in Jerusalem in 1997. In 1998, his anthology of essays on Jewish music was brought out in Chinese by the Music Research Institute of the Chinese Academy of Arts in Beijing under the title Youtai Yinyue Lunwenji. Among numerous other articles, he has contributed entries on aspects of Jewish music to The New Grove Dictionary of Music and Musicians (second edition). 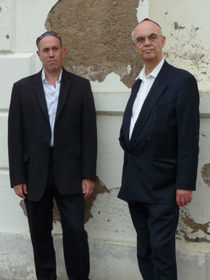 He has been appointed to academic and administrative posts at Wolfson College, Cambridge; at London’s Goldsmiths’ College, Royal College of Music, City University; and most recently (1999-2006) to the Joe Loss Lectureship in Jewish Music at SOAS.